Kuakata has become my regular passion since 2006. And I was determined to make this tour this year as well. My original idea was to spend enough time there to be able to satisfy myself as well as my family. With this plan in mind, I took my yearly leave. But it seemed that luck was not on my side. Yet, I didn't give up, and ultimately did take the big step to go there during a regular weekend. It was challenging not because I had to travel within a weekend, I was taking my family with me, including my 19-month old daughter Lamisa. The journey usually takes a toll on anyone because of its duration and nature. But we eventually gathered enough strength to give it a go. And I'm glad now that we did; it was worth the effort! Previously I took my wife there once in 2007. Sakura is the usual transport option during this time of the year. Other buses don't go up to Kuakata during this off-season. We boarded the bus from Gabtoli Bus Terminal on the night of the 15th. The journey started with a negative, as the bus was late by almost an hour! We couldn't leave Gabtoli before around 12:30AM. And we knew that the journey ahead just became tougher because of that. It was a Thursday and Thursday nights usually are busy, a lotta people leave the City on Thursday nights. We knew that we would have to negotiate as many as 6 ferries on the way, and traffic condition and elements usually play a big part at the ferries. The biggest of the six, the Paturia-Daulatdia is usually the problem child. And we ended up waiting for as long as 4 hours at Paturia before boarding the ferry by around 5:20AM. The night journey ended up in daylight even though we hadn't completed even one-third of our journey! Five-and-half-hours' toil just to cross the Padma! 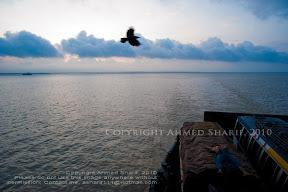 Usually during all my previous journeys to Kuakata, we met daylight at Khepupara ferry, the fourth ferry on the way to Kuakata. The rest of the ferries all conspired to give us pain. All the ferries killed time this way or that and made our journey even more painful. Lamisa wasn't in trouble as she slept most of the way during the night and enjoyed the day ride. We adults actually suffered more. Anyway, I usually took some photos at the last three ferries. But this time round, we were crossing these last ferries under midday sun! So, I kept my camera packed. When we were checking in at hotel, it was 1:30PM; the journey took almost 13 hours!! We were searching for some food and some rest; nothing else! At least, the positive thing was that the time was not good for anything, so, taking rest during those hours wasn't hard to do. We waited for the better times to enjoy the place. When I woke up to get prepared for the walk, it was around 4:30PM. The sun was slowing moving towards the western sky, but not yet tamed nearly enough; summer sun usually sets after 6:30PM. Anyway, seeing my family still recovering from the journey, I came out and strolled the beach. Things were changing the last time I went there, and wasn't exception this time around as well. Lifestyle of people haven't changed a lot though. Motorcycles still speed about the beach, though some restrictions had been applied on the space they could use on the beach. 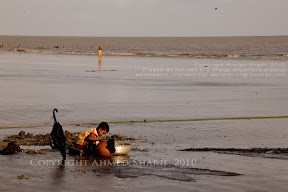 Children were playing on beach and fishermen just went about their duties. What changed were the supposedly fixed stuff -- trees, structures and others. The severe erosion that I had witnessed the previous times, continued. 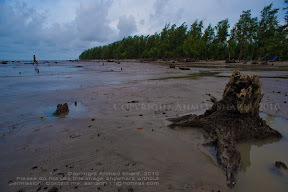 There were now even fewer coconut trees and they were all off to the east of the main beach. 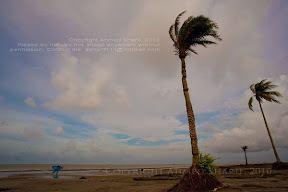 The other trees that were behind the main coconut orchard, were now under threat and some were already down. 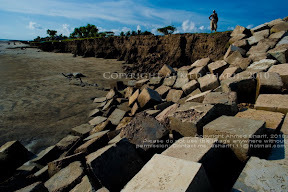 Some structures imprudently made near the beach were now being taken apart by the sea. 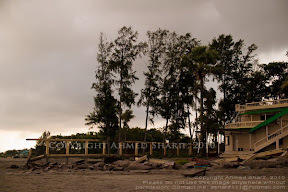 The rest house that I had seen being battered by the sea, now goes under water during high tide. This would be a lesson for anyone wishing to construct anything near the beaches. 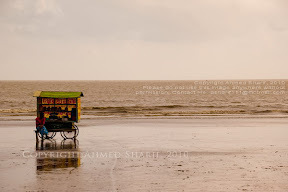 I stayed on the beach, not just waiting for the sun to go down, also wishing for the rain to stay away. I planned on bringing my child to the beach if the weather permitted so. And we were lucky. I brought Lamisa to the beach some time after 6:00PM. The huge sandy flatbed got her excited and she began to discover this new experience. I also took the opportunity to take some memories for her future. 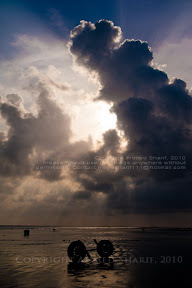 The sunset of Kuakata during the monsoon usually doesn't disappoint, and that day wasn't an exception either. 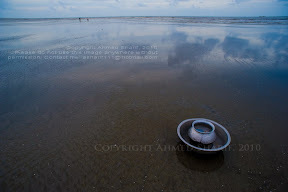 The colourful skies came down on the glossy wet beaches and made us happy. My family was more than happy to feature in some of those captures. We had great fun. We continued to shoot until around 7:00PM when the colours began to fade a bit. The first day at Kuakata, though tiring, had a nice ending. It seemed like worth the effort. Night stay at Kuakata remained a pain as always because of the poor condition of electricity. Severe load-shedding was really irritating. I had seen bad load-shedding at Kuakata before, but with this particular year running, which we almost named after load-shedding, I wasn't surprised that Kuakata performed badly. Anyway, I had big plans for the next day, so, had to take some rest after dinner. 5:00AM, 17th July 2010. The second day began. I had informed a biker, Rahim, last evening, that I would like to go to Gangamati Canal area at dawn. He was dedicated and he didn't miss the timing. We set off by around 5:20AM for Gangamati and were there within 15 minutes. The speedy beach ride through the wet beach in low tide was easy. 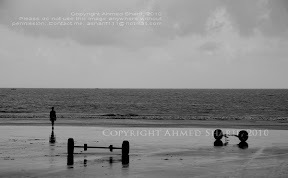 This was not 2008, when I saw many small canals which made smooth riding on the beach difficult. I experienced this new thing in 2009 also. The beach was reformed by the sea. Its now flatter than ever. And the kind of expertise once required to ride through this beach is no longer preventing someone to become a biker. Anyway, it was a gloomy morning and the sun stayed back. There was no sunrise in the real sense. Gangamati looked as bleak as ever under those gloomy clouds. 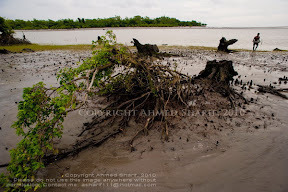 The washed-away stems of mangroves still litter the newly-created beach, which was once a forest. There were fry-catchers there at work. I talked to them and confirmed my observation that the Gangamati Canal was getting wider and shallower. 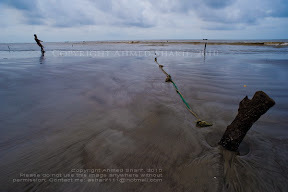 The place where I stood to take pictures in 2008 were now under water even in ebb tide. 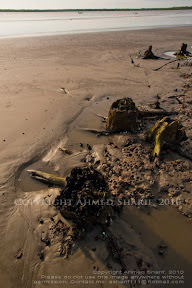 I was standing on some muddy ground which freshly claimed by water. Which was why the ground was muddy, rather than sandy. It was not much more difficult for small boats to cross the canal, because water-depth had gone down drastically. I saw one boat struggling through the shallow canal to reach the other bank. 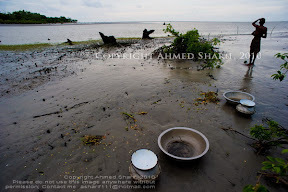 According to the fry-catchers, there were other areas around Kuakata that were gathering all the silt taken off from this area; some islands were getting bigger. 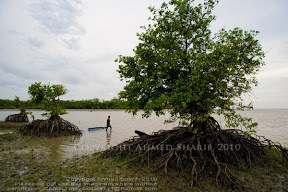 This reminded me of my Nijhum Dwip late last year, where I've seen a growing island. there would be a time when there would be no fries to catch! The fry-catchers said that their business has become dull in recent times. I tried to find out the exact reasons for that, but they didn't have enough information to solve the puzzle. I spent some time walking along the canal; thinking. I knew that I saw almost too many fry-catchers there in 2009. So, there was a possibility of over-fishing. But I needed some more rationale. What about climate change? Could it have an impact? Right when I was burying myself deep in the sad for answers, I found a young fry-catcher. Mohammad Ali was in Dhaka for seven years, working at a garments manufacturing concern. Her was smarter and he knew much more than what I found from others. He was filling up all the gaps in that puzzle. Its true that there were now a lot more people engaged in fry-catching. 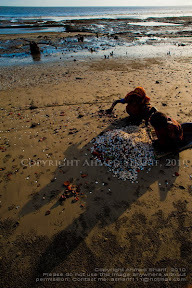 But the bigger problem lay deeper in the Bay of Bengal. There were more people investing in deep-sea fishing trawlers than ever. The reason? Extra profit from unseasonal operations. Usually the trawlers used to catch fish in the deeper waters only in winter times. 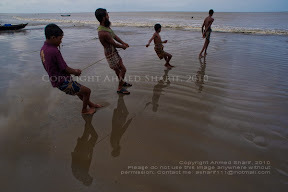 Now, during the off-season (monsoon) they were catching shrimp (locally called Bagda Chingri) with their sophisticated nets. These trawlers are catching the shrimp that were supposed to produce the fries that were caught on the beaches. So, there were lesser number of fries coming to the shore and more and more people were lurking on the beaches to catch them. Did I use the word over-fishing? 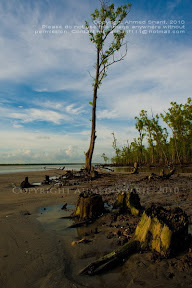 Kuakata is on the brink of an ecological disaster. 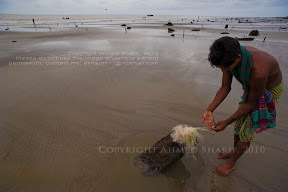 Mohammad Ali showed me a stray piece of net that probably came with the waves. He showed me how that net would catch smaller fishes. 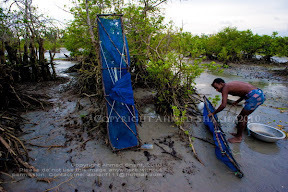 Those nets are made in a way that fishes don't survive their encounter more than several minutes. They were keeping the shrimp, but throwing away other fishes that might've worth millions if they were allowed to live. Ali also told me that the fries caught from the sea usually have more possibility of survival than the ones grown in hatcheries. And the sea-born usually grow into bigger shrimps, he told me. I had some more food for thought, that was the key. Mohammad Ali gave me a new avenue to discover. 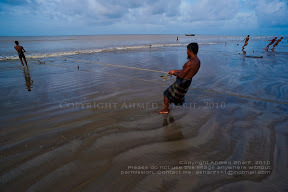 Anyway, after leaving Mohammad Ali, I spent some more time with the other types of fishermen on the beach. 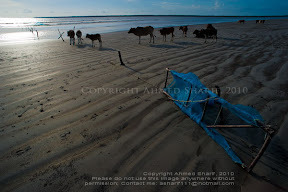 They were the owners of the fixed nets anchored to the beach. It was time for them to pull the nets out of the water. 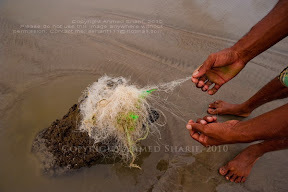 Each net was being pulled by several people, creating bit of a pattern. These nets go a bit deeper than where the fry-catchers go. But they equally contribute to the overfishing situation that I thought I was witnessing. It was around 7:00AM and I thought it was time to end the morning venture. My biker got almost tired seeing me roaming. He wanted me to cross the canal and take a bike ride over there. He was obviously thinking from business perspective, but I knew what to get on the other bank of the canal. My 2008 visit there was enough to convince me that if I didn't want to chase the biggest of the red crabs, I could spend my time on this bank. I came back to hotel and thought it was a reminder of the shabby future of Gangamati. Things didn't look very promising, unfortunately. It did provide me with some opportunity to shoot pictures, but it didn't give me the pleasure I used to derive from many other photo ventures. Anyway, it was time for me be with my family. And the sun already began to shine too strongly to go on another tour of the beach with my child. We stayed at the hotel and waited until the the best opportunity came. Interesting thing was, there was no rain. That was a bit unusual for this time of the year. it seems ironic but we do see the struggle for survival everywhere in Nature..... there are some who always prove the theory of 'survival of the fittest'.... but survival is actually relative to time..... you don't survive; you actually stand long enough to endure more hardship...... how idiotic is that?? I went out right after 4:00PM. Already told Rahim to wait for me with his bike around that time. 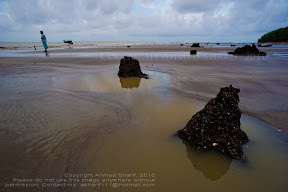 My Kuakata tour would not be complete without a visit to Lebu Bagan, the western end of the Kuakata beach. We were barely 5-10 minutes into our journey and I began to realise how drastically the landscape has been changing. There were now places on the beach which simply could not be crossed on bike or even on foot. The sandy beach was no longer there in some places. Those consisted of no more than rough, but soft, muddy surface. We had to take a detour behind the back of the beach to cross it. These are the grounds claimed by the sea. There was original soil here and probably trees or even someone's house. They are now part of the flood plain; they go under water when the tide is high. A bit further ahead, we found remnants of an embankment. 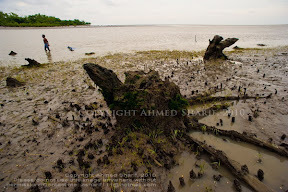 Last year, I saw those embankments built around sand bags and bamboos. This time round, there was concrete blocks. Big tough concrete blocks. But was it any good? That was the question. I talked to some locals about that and they also didn't seem more optimistic than me. They said that the embankment was constructed only 3 months back. And I could see its weaknesses already. 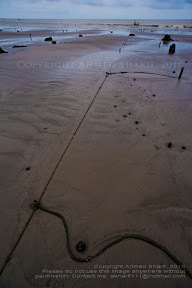 Some blocks were on the way down on their sandy base, while others around the edges were crumbling. Worst still, the concrete embankment is only around 100-200 yards long and rest of the beach is completely in the hands of Nature. What a pity! Not sure what kind of plan was responsible for that; it hardly made sense! 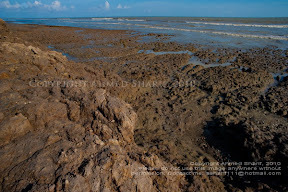 I could already see that the sea was washing away the soil around the edges of that embankment. It looks like the concrete embankment would be creating something like a concrete island in time. All the other soil around it would simply be washed away. 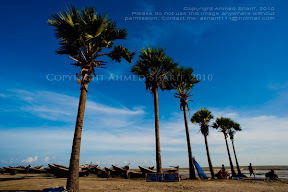 We proceeded from the embankment towards the ultimate destination, Lebu Bagan. As we got closer, the threatened forest revealed itself. 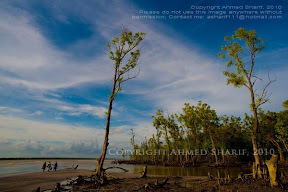 These mangroves were no better than what I had seen a year ago. In fact, there were now flatter grounds around the beach than ever before. 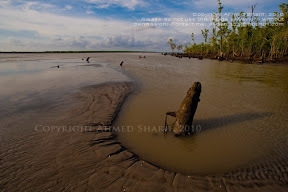 These were all forest once, now they're just a flood plain with remnants of destroyed mangrove trees. 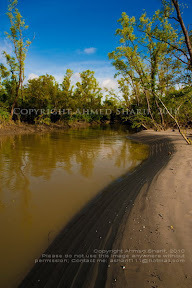 We reached the edge of the Andharmanik River. There was no surf; I only got lucky in 2008 with those massive waves. The sea and the river both were calm now. Some fry-catchers were there crossing the last canal on their feet through waist-high water. 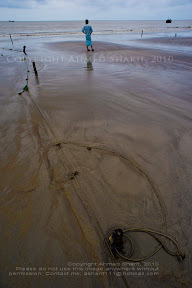 The semi-destroyed Lebu Bagan is nothing new to these local fishermen, as it is to the outsiders like me. There was evidence of destruction everywhere. It gave me the exact bad feel that I had during the last two visits there. I stayed there up to around 5:15PM and then turned back. My family was already there at the main beach and I had to join them for a short relaxing time. 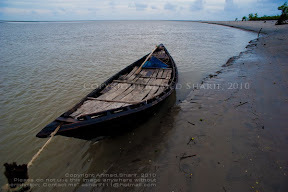 Our bus for Dhaka would leave Kuakata exactly at 7:00PM; so, we would have to pack up and leave our hotel in time. We had just enough time on the beach before we began to pack. We began to realise how short the visit was. A large amount of time was taken away by the journey. 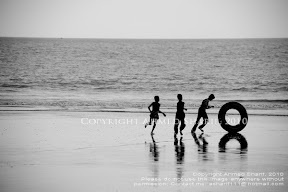 This time round, we spent the least amount of time on the beach. My child was still not that matured. The warm weather kept them inside for most of the day. 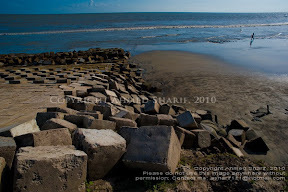 Kuakata is usually famous for its high tide. We mainly kept away from the beach during the high tide. Bathing in the sea wasn't an aim for us; may be next time. I was particularly surprised with the weather. There was absolutely no rain during our stay there. 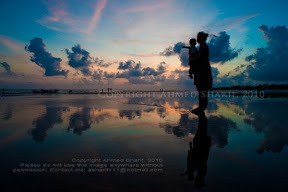 But of course, its the rain clouds that create the beautiful sunsets on the beaches. We missed the second day sunset as we had to move on. We could see the blood red colours of the skies during our departure. The return journey wasn't as taxing on us as the journey in. We reached Dhaka by around 5:30AM. The deadlock at Paturia-Daulatdia ferry wasn't as bad as the previous time. Yet, it took around 2 hours to board the ferry there. A 10.5 hours' journey is something normal for Kuakata. Its tough for most to make it easily. But for me, it has always been rewarding. 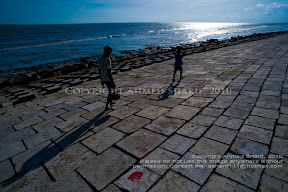 Its true that visiting Kuakata no longer gives me the pleasure I used to have 2-3 years back. But the time-lapse documentation is precious to me. I have the desire to continue this venture of mine well into the future.